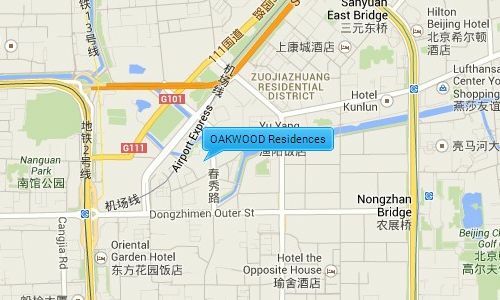 OAKWOOD Residences | 奥克伍德华庭 Oakwood Residences is a modern serviced residence in chaoyang, a growing CBD which is home to many foreign embassies, the sanlitun shopping and entertainment area, as well as the olumpic park, site of the 2008 beijing summer olympic. Its 20 minutes from beijing international airport and within walking distance of dongzhimen subway staion. 24 hrs reception service and security. Oakwood residence beijing offers fully serviced and funished residences, from studio, one, two, three bedroom to penthouse and terrace apartment in elegant classic decor. Please feel free to contact our consultant. Oakwood Residences is situated close to the 2nd east ring road giving it easy access to some of Beijing’s main destinations like city airport, the Olympic village, the Zhongguancun, and popular expat areas such as Sanlitun and CBD, which both contain a vast range of restaurants, shopping malls, supermarkets, health centers and a buzzing night life. It is also close to a major embassy district.